Combine the lentils, garlic, oregano, bay leaf and cinnamon in a saucepan and cover with water by 2 inches. Bring to a boil, then cover, lower the heat and simmer until the lentils are tender, 20-25 minutes. Drain the lentils well and discard the whole spices. In a separate bowl, whisk the olive oil, vinegar, lemon juice, lemon zest, cumin and salt together. Toss the lentils with this vinaigrette and let stand while preparing vegetables. Add the chopped vegetables to the lentils, stir gently. Adjust seasoning for salt and pepper or fresh lemon juice. Roast the shallots: Preheat the oven to 375F. Place the shallots in an oven tray with the skin on, drizzle with a bit of olive oil and roast for 45 minutes. Allow them to cool enough to handle and remove the skins. Transfer the shallots to a food processor, mini-prep or Magic Bullet and add the remaining dressing ingredients. Blend well, taste and adjust for salt and spice. Put the arugula in a large, wide serving bowl and scatter it decoratively with the melons, apple slices and blueberries. 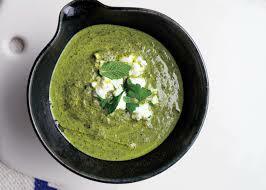 Add the crumbled feta and lastly drizzle with the vinaigrette. Extra dressing can be served on the side. Serves 4. An Autumnal combination — you get the sweetness, nuttiness, crunch, and the tahini in the dressing brings it all together. Kabocha is Japan’s pumpkin — slightly flattened and green dappled with white. Its flavor is similar to pumpkin, but sweeter. If you can’t find kabocha squash, substitute acorn or delicata. With its assertive creaminess and mild saltiness, the French feta, made from sheep’s milk, is particularly good in this dish, but you can definitely substitute your favorite feta. This recipe was adapted from the blog honestlyyum.com by Adrienne for a class Brookside November 18 2015. Preheat the oven 400 degrees. Halve kabocha across its equator and scoop out seeds; using a large chef’s knife, cut squash into wedges. Toss wedges with half the olive oil and lightly season with sea salt and black pepper. Roast squash 25-30 minutes until tender. Remove and discard stems from shiitake; slice tops into strips. Toss in extra virgin olive oil and lightly season with sea salt and black pepper. Roast in the 400 degree oven for 10-15 minutes until they begin to get dark and crispy around the edges. (You can also roast the shiitake and squash together, just remember to remove the shiitake before the squash).Toast the hazelnuts in a small pan over medium heat. Keep the hazelnuts moving to prevent them from burning. When you begin to smell their fragrance, remove them from the pan. Cool and chop roughly. Dressing: In a small bowl, whisk tahini and honey; add lemon juice and vinegar and incorporate well; slowly add olive oil and continue whisking until the ingredients are emulsified and the dressing is smooth; if the dressing is too thick, add more olive oil to achieve the right consistency. Season with salt and pepper. To assemble the salad, arrange the squash wedges on a plate. Combine the arugula, hazelnuts, shiitake mushrooms, and wheatberries in a bowl and toss with dressing. Place the salad between the wedges and top with several cubes of French feta; drizzle with additional olive oil. Begin by cooking the lentils: rinse them well, put them in a saucepan and cover in water by 2 inches. Bring to a boil, then cover and lower the heat, and simmer until tender, 20-25 minutes. While the lentils are simmering, whisk together the dressing ingredients in a small bowl. Drain the lentils thoroughly and toss with the dressing, then refrigerate for 20 minutes to cool and allow the dressing to soak into the lentils. 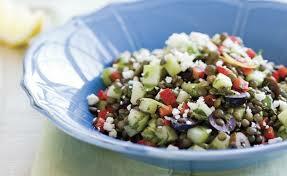 Chop the pepper, cucumber, olives, mint and parsley and add to the lentils. Adjust for salt and pepper. Sprinkle with feta cheese and serve. Store in an airtight container 3-5 days. Serves 6. Bring a large saucepan of salted water to a boil. Add the beans and simmer until just crisp tender, about 5 minutes. Drain the beans and run cold water over them to cool them quickly. Drain completely; dry on paper towels and place in a large plastic bag. Combine lime juice, olive oil, 1/4 cup onion, sliced pickled jalapeños, sea salt, oregano and cilantro. Pour over beans and toss. Let sit for half an hour. When ready to serve, gently mix in the chopped red onion, corn and cheese. 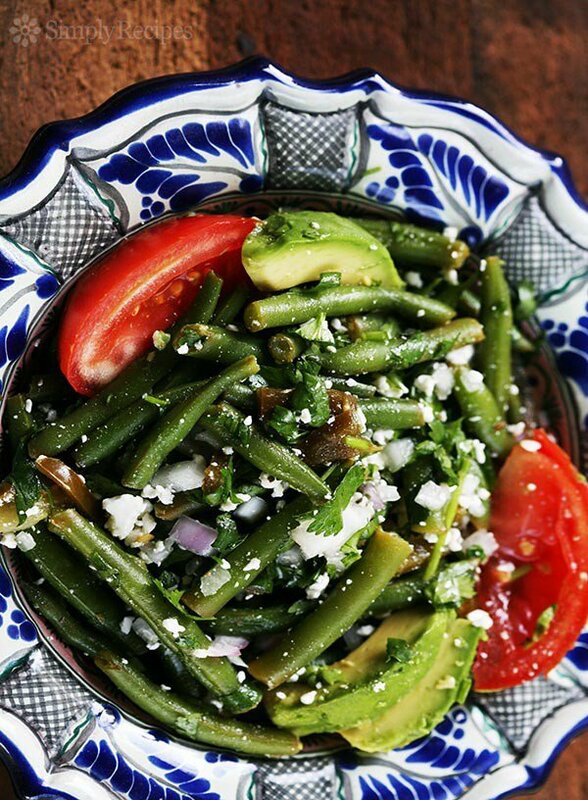 Serve the avocado slices and tomato wedges on the side or mixed into the salad. Serves 6.